Automatically senses generator power and prevents two power sources from entering the AC Distribution Panel at the same time. 120 VAC, 30 Amps, Pig tail AC wire connections. Quick change circuit board is easily replaced in the event of failure. No need to disconnect and reinstall the entire unit. Time delay feature ensures generator voltage is at a stable level before transfer occurs. Built-in strain reliefs allow the installer to simply push the branch circuit wires inside the unit for connection. 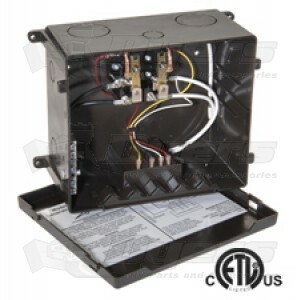 Eliminates the need to purchase and install separate strain reliefs for each circuit. This transfer switch is working great to integrate the Go Power 2000 watt inverter into my electric system.